Betta fish are one of the most popular aquarium hobby fish in the world. They are particularly hardy, and come in a wide variety of colors and fin types, making them a great fish to own. They are a very special fish that has something called a labyrinth organ that allows them to breathe oxygen from the air. They trap the oxygen in the labyrinth organ, and can continue to breathe from this supply underwater for long periods of time. Because of this amazing adaptation, many people believe you can keep a betta fish in a small cup or vase. While they might survive, they most certainly will never thrive in such a small environment. I recommend a MINIMUM of 2.5 gallons for a betta fish, though 5 gallons is more suitable, and will be much easier to maintain, since it will be more stable. 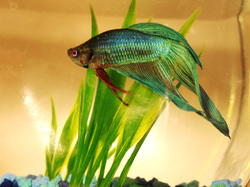 Betta fish really enjoy live plants for a variety of reasons. They really like swimming through the plants, they like to "play" with some types of plants, and they will even use broad leaved plants like a hammock and sleep in them at night! That keeps them closer to the surface, so they can easily go up to the surface for air in the middle of the night. In addition, live plants keep the water clean, which leads to healthier and happier betta fish. They also like to have some sort of cave or hiding spot where they can go to "get away from it all." In a small tank, it's often difficult to find a rock or driftwood that has a nice cave in it, so you may need to use a synthetic aquarium decoration. Just be sure there are no sharp edges, because betta fins are very fragile, and can get torn on rough edges which can easily lead to fin rot. If you do decide to get a betta fish, make sure you do some research first. Many people just starting out in the hobby rush into it, and take advice from employees at big chain pet stores who really don't know as much as they may lead you to believe. If you don't know what you need before you go to the store, you may end up wasting money on a lot of stuff that simply is not suitable for betta fish. If you have specific questions, find a good betta fish forum where you can talk to other betta fish enthusiasts and get all of the answers you need.